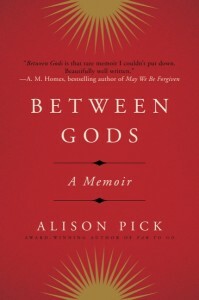 Between Gods by Alison Pick is a memoir of the author’s grappling with her religion after learning that her father’s family were Jewish. Profound, honest, and masterfully written—Between Gods forces us to reexamine our beliefs and the extent to which they define us. Growing up in a tight-knit Christian family, Alison Pick went to church regularly. But as a teenager, she discovered a remarkable family secret: her paternal grandparents fled from the Czech Republic at the start of WWII because they were Jewish. Tragically, other family members who hesitated to emigrate were sent to Auschwitz. Haunted by the Holocaust, Alison’s grandparents established themselves in their new lives as Christians. Not even Alison’s father knew of his parents’ past until he visited the Jewish cemetery in Prague as an adult. This atmosphere of shame and secrecy haunted Alison’s journey into adulthood. Drowning in a sense of emptiness, she eventually came to realize that her true path forward lay in reclaiming her history and identity as a Jew, and she began attending conversion classes. But the process was far from easy as old wounds were opened, and all of her relationships were tested. I very much enjoyed this book. Memoir is one of my favorite genres to read and I was interested in the topic of spiritual exploration as I continue to figure out what my beliefs are and what sort of spiritual/practice that equates to. I wished there was a bit more family history with how some of Alison’s family assimilated to their new life in Canada as Christians after escaping Europe, but it’s clear for her family that there was a lot of emotional baggage and secrecy to overcome. What surprised me the most about the author’s experience was just how difficult it was to experience the various levels of Judaism, everything from the high holidays to various rituals within the faith. I know a few people who have converted to Judaism when they married, but had no idea of how difficult and intensive the process is– or how, dare I say, bully-like some of the leaders of the Jewish community could be when it came to conversion. It was fascinating to read about these aspects of the author’s experience, a bit more than some of her personal feelings on the process. The memoir also grapples with the author’s lingering depression and emotional state, some of which is a result of her family’s history and her spiritual awakening. Oddly, these portions of the book were the bits I enjoyed the least. There were more than a few occasions that I don’t think the author really kept herself accountable or was completely honest and open to her feelings on a particular topic or experience. What I appreciate the most about memoir is not just the honest retelling of a story/moment in time, but that vulnerabilities the author puts out there. Don’t get me wrong, it’s incredibly vulnerable to write a memoir about how you are coming to terms with your moral and religious beliefs, but I felt like some of the dealings with her parents and her husband lacked some of the depth of emotion that I think they needed. Overall, I would definitely recommend this book to anyone interested in memoir, especially if you’re interested in religious journeys. While I read a fair amount of memoirs, I have not read many that fall into that particular category, so it was a great treat to have a well-written book to fill that void for me. As part of the TLC Book Tour of this book, I was provided an advanced copy of the book in exchange for my honest review. All opinions are my own. I’m fascinating by journeys of faith and family history so this book is right up my alley.